The weather is finally catching up with the time of the year with dropping temps across the USA. While the holiday season passed us up here in Florida when it comes to the weather, Lexus is bringing some frigidness in the form of a set of ICE Wheels on a new Lexus NX crossover. Such a concept has never been attempted – so they say. 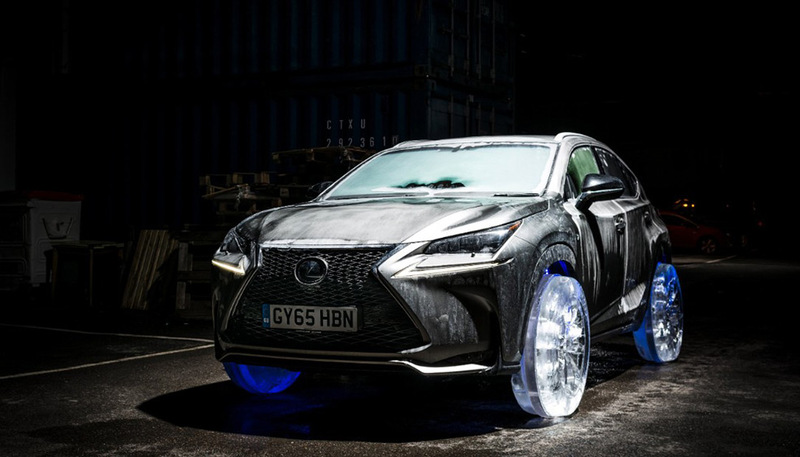 At the hands of professional ice sculptors, Lexus fitted a new NX crossover with a set wheels and tires made of ice and drove it around for some stylish captivation as shown in the videos below. Check it out along with a brief behind the scenes of how they did it. The concept of driving on ice has taken on a whole new meaning for Lexus, which has crafted the world’s first set of working wheels and tyres made from frozen water. Brussels, Belgium – True to its mission of “creating amazing” and inspired by the craftsmanship that goes into every vehicle it makes, Lexus commissioned a team of ice sculpture specialists to explore how ice could be used in place of conventional alloy metal and rubber. After three months’ research, design and testing, the finished wheels were fitted to a Lexus NX for the ultimate ice drive. The car itself was deep-frozen, stored for five days at -30°C (it started first time) before being driven off down a London road. The addition of in-wheel LED lighting added an extra dramatic dimension to the cutting-edge contemporary styling of the NX. The project was undertaken by Hamilton Ice Sculptors, a London-based business established for more than 35 years with world-leading experience in producing innovative and large-scale works. For the Lexus commission – the first of its kind – genuine NX wheels and tyres were laser scanned and replicated using computer design and numerical control techniques. The result was an unprecedented fusing of art and engineering. Just as the skills of Lexus’s famous takumi craftspeople are used to achieve the highest quality, the human hand and eye were fundamental to the success of the project. Four sculptors worked for 36 hours to produce each wheel. The millimetre-perfect finish was achieved with hand-crafting, using Japanese steel & wood chisels and shaping tools. Even the tread patterns on the tyres were faithfully reproduced.